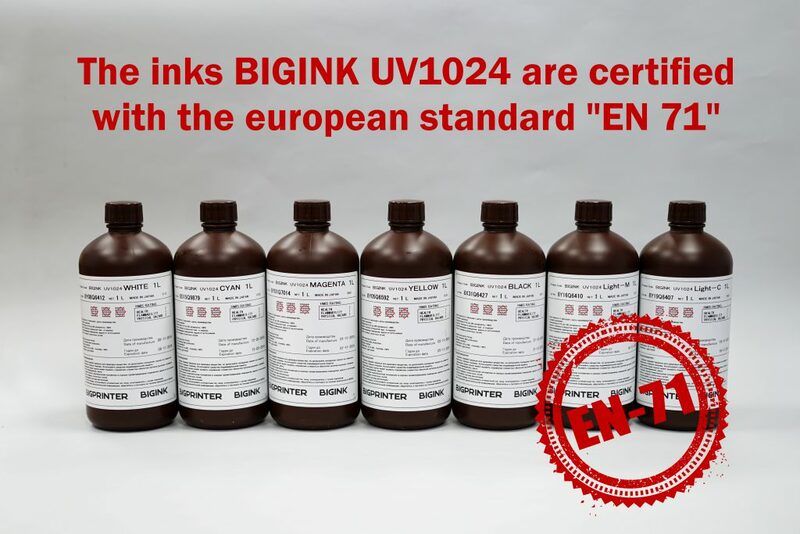 The inks BIGINK UV1024 are certified with the European standard “EN 71”. EN 71, which is also a part of the CE directive, has been put in place to ensure that all toys sold in the EU meet certain minimum safety standards on the following factors: mechanical, noise, flame retardance, chemical composition, electrical safety, sanitation, radiation. Product safety is always a big deal, but even more so when it regards products that are (exclusively or not) used by children. any product for use in play and intended for children under 14 years, shall be classified as a toy – and is therefore required to be EN 71 compliant. Therefore, printing with BIGINK UV1024 ink can be used even in the production of toys for children. The presence of this certificate expands the applications of the UV printing with BIGPRINTER printers.